I first shared this recipe on Penney Lane where I was a contributor. 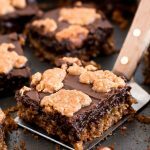 Oatmeal Chocolate Fudge Chewies are amazingly delicious chocolate cookie bars that are easy to make and perfect for feeding a crowd. My mouth is watering as I write this post. 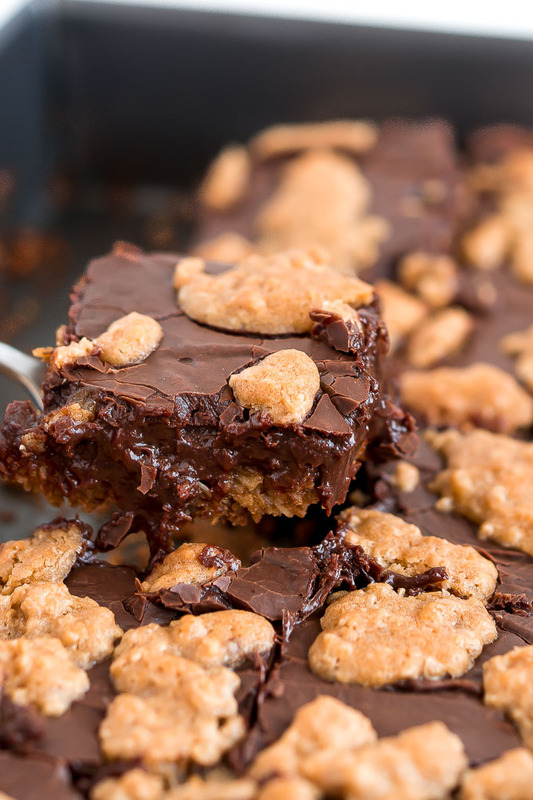 I want one of these Oatmeal Chocolate Fudge Chewies so bad but they’re all gone. Sad day! My awesome aunt introduced me to these addicting cookie bars when I was little and I have now made them way too many times to count. They are way addicting. How could they not be though? 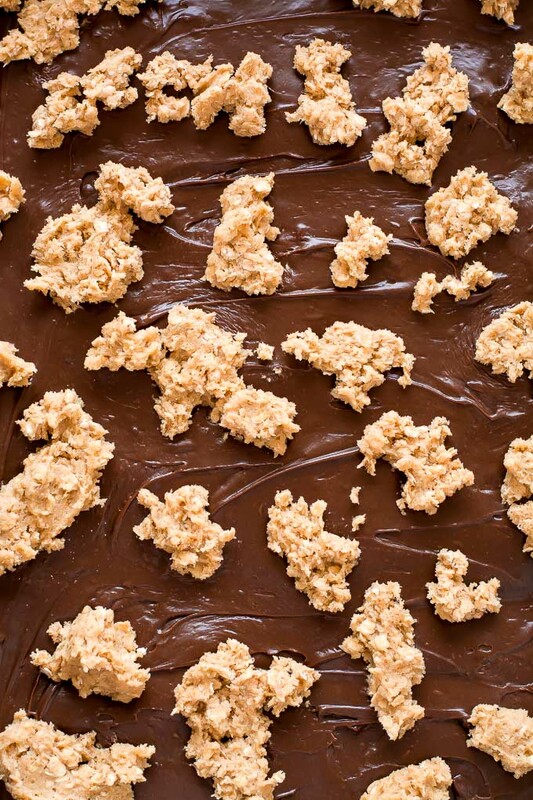 We’re talking about a combination of oatmeal cookie and ooey gooey chocolate fudge. It’s a no brainer guys. The bad/good thing is that they are so easy to make. Sorry if you become so addicted to these that you put on a few pounds. I would say the hardest part is stopping yourself from eating too much cookie dough. 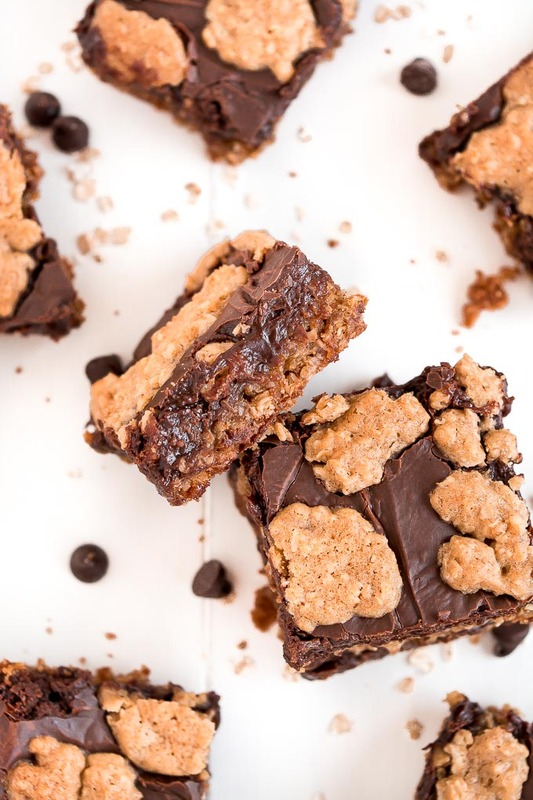 This cookie dough, Chocolate Chip Cookie Cake, and Bakery Style Chocolate Chip Cookies cookie dough are irresistible! I’m usually a stickler about food safety but when it comes to cookie dough my mind only focuses on one thing- getting more cookie dough in my mouth. But anyway, don’t eat too much dough or you won’t have any to dollop on top. So, after you make the oatmeal cookie dough (and sneak a few bites), reserve some dough and spread the rest in the pan. Then you melt the chocolate chips and mix it with sweetened condensed milk (yeah, that stuff is from heaven) and spread it over the dough. 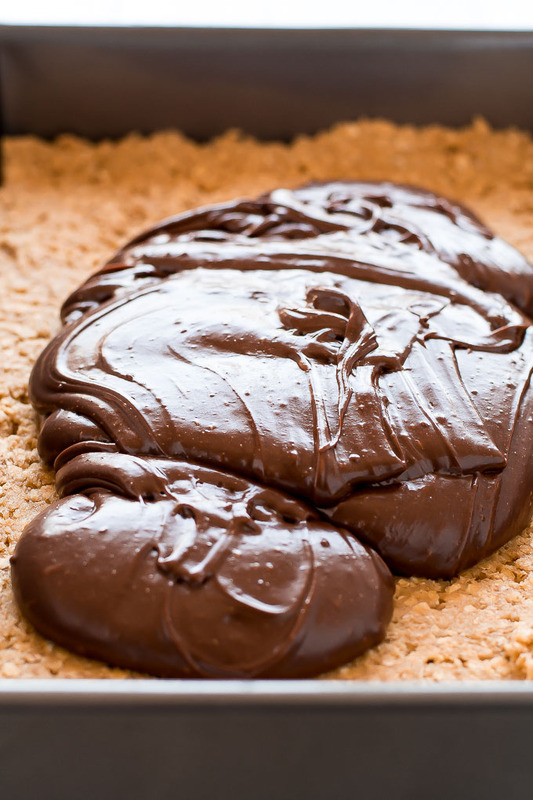 Finish up by dotting the fudge layer with the dough you set aside. Hopefully you didn’t pick too much at it and still have some left. Enough about the cookie part. That fudge layer is divine! 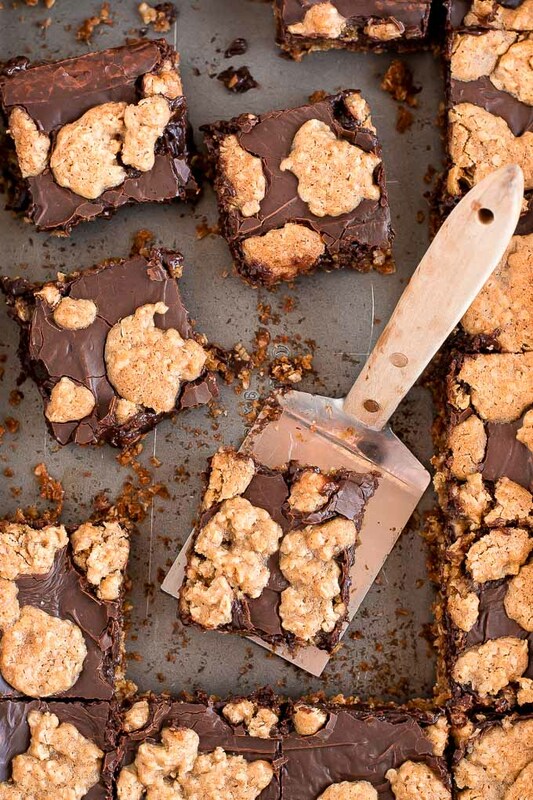 Ooey gooey rich chocolate never tasted so good! K, I nee to go make an other batch of these. See ya! 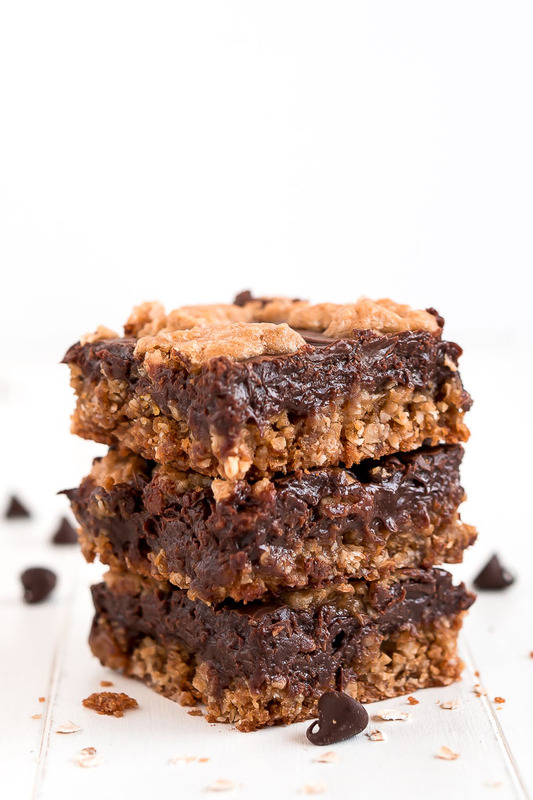 Oatmeal Chocolate Fudge Chewies are amazingly delicious chocolate cookie bars that are easy to make and perfect for feeding a crowd. Preheat oven to 325 degrees F and grease a 9x13 inch baking pan. In a mixing bowl, mix the flour, baking soda, and salt; set aside. Cream butter and sugar for 3 minutes in the bowl of an electric mixer until creamy. Add vanilla and eggs and beat until smooth. Mix in the flour mixture and then the oats until combined. Measure 3/4 cup dough and set aside. Spread the remaining in the bottom of the pan. Heat the chocolate chips in the microwave for 1 minute. Mix in the evaporated, salt, and vanilla and then microwave in 30 second increments until melted and smooth. Spread fudge over the dough and then dot the 3/4 cup dough over the top. Bake for 34-36 minutes until top is golden. 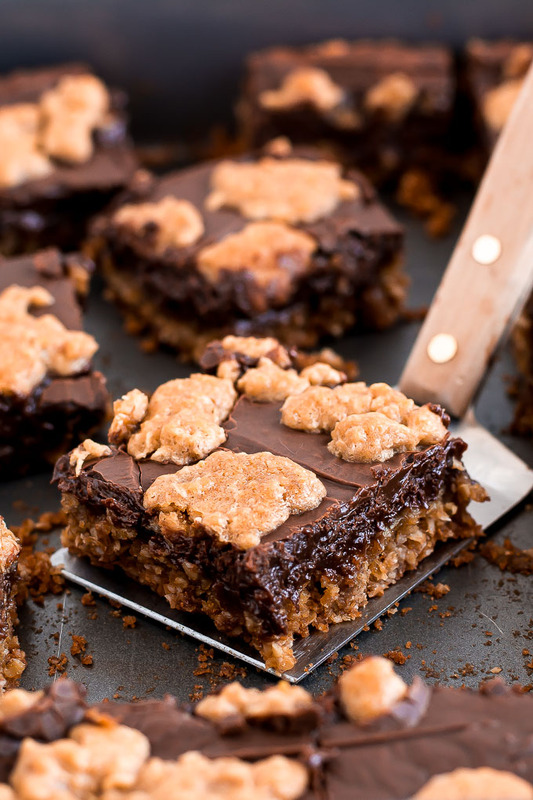 Try these delicious cookies bars too! These look amazing! I wish I was snacking on some of these right now!